by Nominet, the official registry for .uk domain names. The tiny island – 12 sq km (4.6 sq miles), a former British protectorate that has been a territory of New Zealand since 1925 – is an online giant in terms of the number of country-specific domains it has registered: more than 31m in all, bigger than China or Germany, its closest country rivals in terms of domain numbers. The reason for the large number of registrations is due to the country’s unique operating model, conceived by Dutch entrepreneur Joost Zuurbier, which allows overseas internet users to register domains for free. 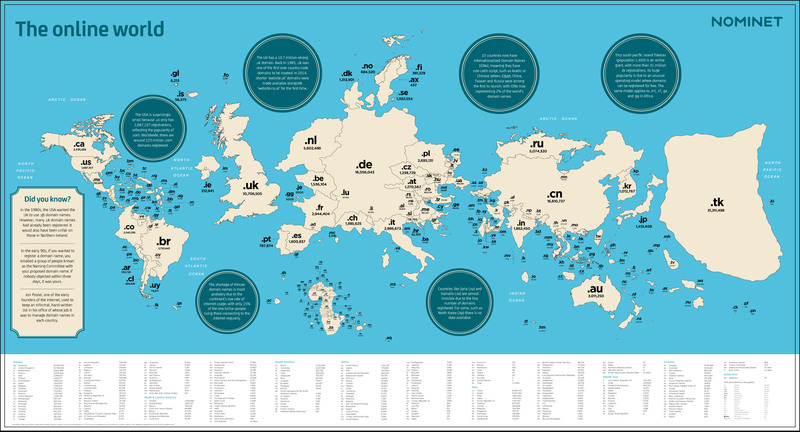 The map, in which countries have been scaled according to the number of internet domains registered there, shows that China and Germany each have just over half the registrations of Tokelau, at 16m-plus domains each. The UK is the world’s fourth largest nation, having registered 10.7m domains or 3.4% of the overall share. The .us domain is relatively small at just 1,687,107 registrations, or just 0.5% of the overall total. Nominet says this is due to the preponderance of .com usage in the US. Some countries, such as Syria (.sy) and Somalia (.so), are almost invisible on the map due to the tiny number of domains registered.